It’s good to plan ahead, and it’s even better to have something substantial sitting in the fridge ready to go for those ‘look, it’s been a long day, can’t really be bothered cooking anything at all’ kind of nights, of which, in December there are oh-so-many. It’s a busy time of year, and I feel as if I’m being wrenched all over the place, balancing this with that and sometimes failing at everything. I don’t suppose that sense of busy-ness is helped by being married to a vicar. They tend to be run off their feet in December, perhaps understandably, what with the whole upcoming virgin birth celebration thing. There’s a tax return to do in the middle of all this, too. I often find that the best way to cut through all of this mayhem is to take things ultra-slow. I read a superb book this year, by Carl Honore, called In Praise of Slow: How a Worldwide Movement is Challenging the Cult of Speed. It describes the ‘slow’ movement, which aims to ratchet things down a notch and enjoy life a little more simply. It’s an influential and important read, and I think of it often, mainly when my laptop collapses under the strain of trying to wrangle eight spreadsheets and a conference-load of Powerpoints all at the same time. Do one thing at once. Whoever made up that rubbish about people being able to multitask was completely wrong – people multitask even worse than Windows PCs. Cooking is an obvious way of putting some of these slow principles into action. Here’s a recipe that will produce, when the time comes to put it together, when you’ve battled through the driving, freezing rain, stumbled in through the front door, trod on the cat, and shed your dripping coat, a delicious meal in a few minutes. The key is preparation and planning. You need to think ahead, but a little planning will pay huge dividends. Pork belly demands slow cooking. There’s no point roasting it at a high heat, as you would a chicken. After an hour and a half at 200c, it’ll be about as tender as a piece of lino. It needs time, lots of time, and a low heat. A half belly piece, from the thick end, off the bone, is a chunky piece of meat. It’s getting more expensive as more people realise just how good it actually is, but it’s still a steal at about £7-ish for a substantial piece of pork, weighing in at about a kilo and a half. Score the fat side with a razor blade, or better still, get the butcher to do that for you. He or she should offer, and if they don’t, think seriously about finding a new butcher. The scoring makes the skin crisp when it’s roasted or finished in a hot pan. 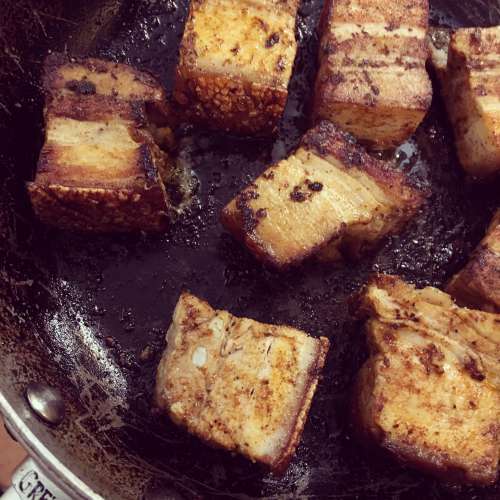 Tuck the pork belly into a roasting tin that’s only just bigger than the meat itself. It should be a snug fit. Ordinarily, pork is best simply roasted in the oven, just as it is, but this time, I decided to braise it in beer. Use a gutsy, characterful beer, not too hoppy, but with plenty of spine to it – a bitter of some sort would be good, but steer clear of anything too dark. Keep the stouts and porters for pairing with beef. Empty a 500ml bottle of your chosen beer into a pan, add a tablespoon of sea salt and another tablespoon of dark brown sugar and bring it to the boil. Add a couple of tablespoons of thyme leaves and a few bay leaves if you have them, and pour the braising liquid over and around the pork. It should reach almost to the top of the meat – top it up with water if it doesn’t. Cover the meat with aluminium foil, crimping it down to make a tight seal, put the pork in the oven, at 125c, and leave it there for at least four hours, or until the pork is soft and tender, but not quite falling apart. This should take no more than ten minutes to get to this stage in terms of active effort. When the pork is cooked, take it out of the oven and find a plate or a pan that’s a little smaller than the roasting tin, so that it fits inside. Place the smaller pan or plate directly on top of the foil, and add something of weight – a few jars or cans of beans are ideal – so that the weight presses down on the meat. The idea here is to press and flatten the pork, letting it cool in the braising liquid with some downward pressure exerted. Once cool, transfer the whole lot to the fridge and leave overnight. So, what you’ve got now is a star ingredient, a piece of pork braised for hours in flavoured beer, pressed and cooled, ready to go. You could just use it like this, carving thick slices away for sandwiches or to drop into noodle broths or just to eat stood in front of the fridge, but the real trick in this recipe comes next. When you’re ready to cook, take the pork out of the fridge, and out of the braising liquid, which will now be thick and gelatinous. You’ll need to scrape and wipe the set beer away. Slice the belly into serving pieces – squares about an inch across are a good size – and dredge them in Cajun spices. This will give the pork a proper kick. A Cajun spice mix is another one of those kitchen standbys that I find invaluable. It’s a fiery, pungent concoction of spices and salts that gives an immediate boost to many, many things. I use it with meat, fish and chicken, as well as with eggs – a sprinkling over the top of an omelette transforms it. Making a good Cajun spice mix is very easy. Do not buy anything pre-packaged for this under any circumstances. There really is no need. Measure out a tablespoon each of black peppercorns, sea salt, and paprika, and add a teaspoon each of cayenne pepper, cumin seeds, coriander seeds and dried thyme. Blitz everything to a fine powder in an old coffee grinder or in a blender. This mix will keep for ages in a jar, so it’s worth making big batches. Rub a couple of tablespoons of the spice mix into the meat, massaging it gently so that each side is covered. You fancy more spice, then add more spice. Heat a non-stick frying pan over a moderate heat with a splash of olive oil and fry the belly pieces carefully on each side, taking care not to let them catch and burn. It’s important to control the heat so that the meat heats through, but doesn’t burn. Pay special attention to the skin – get that part nice and seared and crisp. Serve with whatever you like – rice, couscous, mashed potatoes and a simple salad are good calls.